The Branson and Lakes Area is home some to some great trails, and Spring and Fall are perfect times to get out and see the lesser-experienced parts of the Ozarks. You'll find one great example if you get out and hike the trails of the Busiek State Forest, about 15 minutes north of Branson. 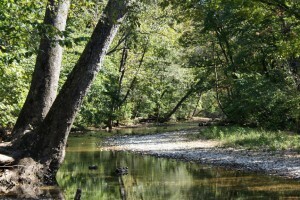 Busiek State Forest and Wildlife Area comprises 2,500 acres just north of Saddlebrooke in Christian County. U.S. Highway 65 bisects the state forest, and the two trailheads are easily accessed from the highway. 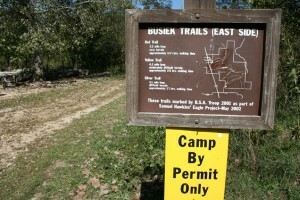 The Branson area has numerous hiking trails, but Busiek is one of the few areas that allows overnight camping (by permit only, available through the Springfield office of the Missouri Dept. of Conservation). 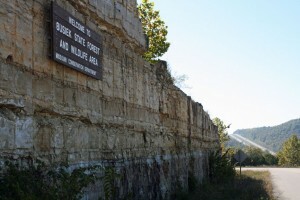 The two trail systems extend more than 18 miles through some of the most beautiful and rugged areas of the upper Ozarks. 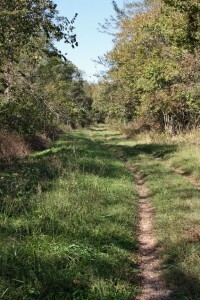 There are two hiking trail systems available, a 10-mile "East" trail system, and an 8-mile "West" trail system. Each system has three color-coded loop trails that range from 2-4 miles each. The trails use as their backbone old dirt roads that travel through the Camp Creek and Woods Fork valleys, and the satellite trails extend from there. All trails are mixed use, meaning they are open to hiking, mountain-biking and equestrian use. Motorized vehicles are prohibited. Elevation ranges from about 980 feet above sea level to 1,200 feet on the mountaintops. With some careful planning (and a camping permit), the trails also could be used for a weekend backpacking trip, though to do so you'd double-back at certain times during the hike. There are nine primitive, designated campsites, each relatively close to the eastern trailhead. Primitive camping is allowed by permit only in designated areas. No potable water or amenities are available. The state forest actually comes close to touching the Mark Twain National Forest, but the two are separated by several tracts of private property. The state forest was named in honor of Dr. Urban and Erma Marie Busiek when the state purchased the first sections of land from their son, Dr. Paul Busiek in 1981. For a nice trip into nature, plan for a day hike along portions of the White and Purple trails in the West part of the forest, and the Red and Yellow trails in the East part of the preserve. The trails are very well marked with spray paint on trees at eye-level, and are well-worn from use. Start with the White/Purple trails, which head west and follow Camp Creek, a wet-weather stream. 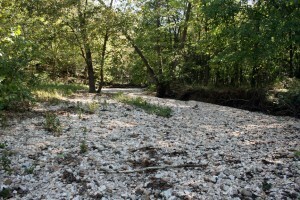 During dry months, the streambed might be more dry gravel than stream. After it rains, then there will be a burbling creek and maybe some muddy spots on the trail. After about a mile, the Purple Trail splits off from the White Trail, at which point fit hikers looking for a challenge will want to start climbing upward and ascending more than 200 feet. Then the trail follows the ridgeline for more than a mile and descends the mountain using a series of switchbacks, eventually ending back at the trailhead. After a short break, you can move your vehicle to the east-side trailhead and began hiking the Red/Yellow trails. The trail begins by following Camp Creek again, this time southward, running parallel to U.S. Highway 65. You can't see the road, but you might hear traffic in the distance for the first half-mile of the hike. As the trail turned eastward, the Red Trail splits off, but you can stay on the main Yellow Trail for another half mile until you reach Woods Fork Creek. Unlike the other streams in this valley, Woods Fork has running water year-round. There had been a footbridge crossing the creek, but it was washed away in Spring floods a couple of years ago, and the state hasn't yet replaced the bridge. While the stream is only about 20 feet across and about a foot deep ... and little trouble for a horse to cross ... it's more problematic for a hiker. Without a mechanism to cross the creek on foot, you might want to consider most of the Yellow Trail off-limits to all but horse traffic until the state repairs the crossings. This lack of a crossing also makes it very difficult to reach the remote Silver Trail on foot. 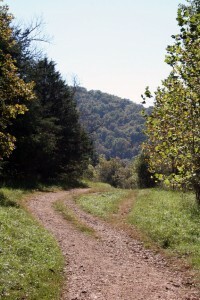 Even without that access, Busiek offers some beautiful valley views and vistas. Limited deer hunting and fur trapping is allowed in the state forest at certain times of the year. If you hike or camp during these times, it's advisable to wear orange blaze.